Summary: Top fan activity is underway on Nbeads’ Facebook page (https://www.facebook.com/nbeads). Welcome to join in it! We will offer you huge coupon as reward. Top fan activity is underway on Nbeads’ Facebook page (https://www.facebook.com/nbeads). Welcome to join in it! We will offer you huge coupon as reward. In the app page, log in your Facebook Account. How to become the top three? Like, comments and share as more as you can on our Facebook page, every action will be calculated in the total actions. It will helpful for you to get the top reward. Cash coupon only for the top three. The cash coupon can be used only once. No other restrictions. 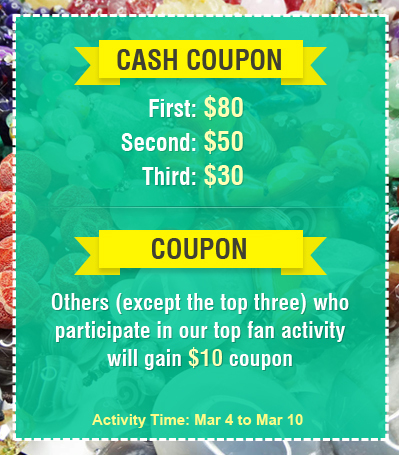 Coupons are for other (except the top three) participators, everyone can get a $10 coupon. When your goods amount equal or more than $100, you can use it. When you see our winners’ list, leave your mail address to us. We will send your deserved reward to it. What are you waiting for? Just come on and join us, it’s easy and funny. Good luck! Please Note: The validity period of your cash coupon and coupon is one month.